I did talk to a couple other guys that were out the past few days and the bite has been steady with everyone catching 5 to 10 sails per day. The 38 custom released 9 yesterday, one of the 32’s in the charter dock also released 9 yesterday and a 40′ private boat released 6 on Sunday. So much for fish not biting on the full moon. I apologize for being a little slow on emails and phone calls. I have had the flu for 3 days so it’s been tough getting caught up. 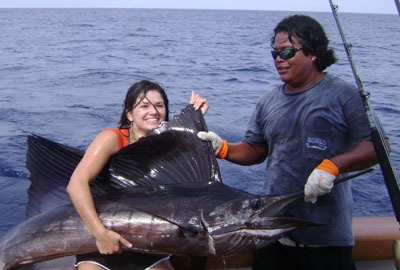 The above photo is from the Blanch group that recently fished Quepos…they released 6 sailfish on a full day trip. The past 3 or 4 days has not been very busy at the marina but the guys that have been going out are doing pretty good. The 28′ center console did a half day yesterday and caught 2 rooster, 5 amberjack and a couple sailfish. The day before the same guys released 7 sailfish on a full day trip. The 33 Proline released 8 sailfish yesterday on full day trip. There have not been many boats going out the past few days but the word on the street is there is a hot bite out by the double zero line. I talked to 3 or 4 captains that said several boats are getting 20 sailfish bites per day. I am still trying to verify this info but it came from good sources. I was able to confirm the hot sailfish bite…it was 45 miles out by the 00 line and there were some boats getting 20 or more bites. There were also good boats right next to them that were just getting 6 to 8 bites. So it was a hot bite for some guys and a ok bite for others. I just returned from 3 days tarpon and snook fishing on the San Juan river in Nicaragua and I am worn out. The weather was perfect, the lodge and food was great, we drank more cold beers than I can count and the fishing was good enough. I caught my biggest tarpon so far about 180 pounder. My buddy caught a 140 pound tarpon and we also caught a 12 pound and a 20 pound snook. This is not the place you go for a bunch of fish. Fishing for big tarpon is like fishing for marlin. You troll all day and hope to get 2 or 3 bites and if you get one fish to the boat you are lucky. I am getting caught up with unpacking, laundry and emails…I should have a local fishing report by this afternoon. The offshore bite continues to be good one or two days and then slow one or two days. The 33 Proline went for 4 for 8 on sailfish today and also caught a couple nice mahi mahi. The 35 Ocean went 2 for 4 on sails yesterday and caught a couple mahi mahi…one in the 60 pound range. One of the better private boats went 1 for 3 on sailfish a couple days ago. Half day trips have been tough this week with the slower bite…if you got 1 or 2 fish on a half day you did better than most. I talked to one of the best captains in the marina today about the fishing this year. He has been down here 25 plus years and has caught more fish than he can count. He said for a El Nino year the fishing is still good. He told me about one El Nino year in the late 90’s and he said you could,t have caught a fish with dynamite. I am leaving in the morning for my tarpon trip to Nicaragua…hopefully the big boys will be biting and I’ll have some snook to the dinner table. We had already made plans to fish when a couple not so great fishing reports trickled in last night. One guys went 6 for 12 on sailfish but one of the best boats in the marina caught nothing…and lots of boats just 3 or 4 fish. I made a few more calls and it turned out that they only guys that did good were about 26 miles out at the corner. Everyone and their brother was at the corning first thing this morning…we had a couple bite right away and my buddies girlfriend caught her fist ever sailfish so that was a good start. We usually don’t pull any sailfish out of the water for pics but this was her first and who know’s maybe her last sailfish so we did get a quick pic before a clean release. From then on it was slow, slow, slow. We raised another sail mid day and that was the end. 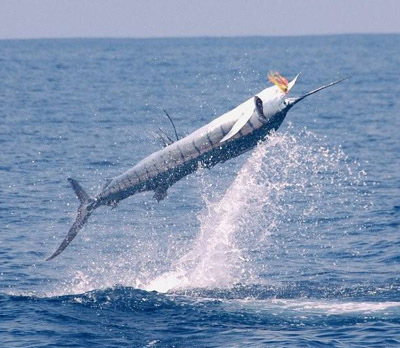 There were a couple marlin raised, one boat raised 6 sailfish and a couple boats caught wahoo. We went 1 for 3 on sailfish and were on my friends 53′ Custom and we were living the high life. Air conditioning, leather sofa, 2 flat screens and a ton of good food. We had steak and shrimp sandwiches, garden salad, sausage appetizers, cold beers and a bottle of Grey Goose. We watched a couple Ceech and Chong movies and had a great day despite the slow fishing. The fishing the last couple days has been a good mix of fish. The seas have still been a little choppy but way better than last week. One private guy was out 30 to 35 and he said the yellowfin were thick and they caught a bunch in the 15 to 50 pound range. He said there were some bigs ones in the pack. I talked to another guy that said the commercial tuna boats moved in there late afternoon and the next day the tuna were gone. The 28′ center console went out yesterday and went 2 for 4 on sails and caught a striped marlin…they even came in 3 hours early. The 36 Topaz released 6 sails yesterday. The guys on the 42′ Maverick have caught 2 black marlin in the last week…they caught one yesterday that was in the 500 pound range. They have also been getting a handful of sails each day. The 33 Proline went 4 for 7 on sailfish yesterday and I think they caught a mahi mahi as well. They caught a blue marlin the day before as well as some sails. It may sound strange but this is like the fishing we usually have in November…a little more chop and a wide variety of fish offshore. We have all thought that the season was a couple months behind but 4 months behind…I hope so that would mean we are in for some above average fishing the next 3 or 4 months….cooler temps and shorter runs. I’m going out tomorrow for a primadonna day offshore…going out on my buddies 53′ Custom with duel flat screens, outdoor grill, air conditioning and all the comforts of a small condo. I just picked up a couple kilos of jumbo shrimp and the captain is bringing along a tenderloin, sausages and a bunch of cold beers…yum. 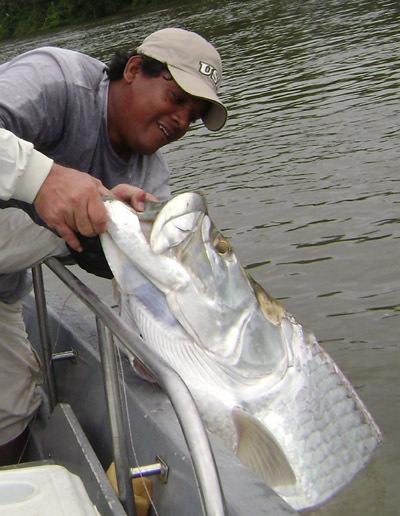 I leave mid week for a tarpon and snook trip up on the San Juan river in Nicaragua. I waited until the new moon passed a couple days and will be fishing alone hoping for a 200 pounder. Last time I tried small ballyhoo on circle hook but they would not troll correctly at slow speed. This time I put an order with my captain friend for sardines and I am taking my bubble bucket for live bait…not sure if we will drift them, slow troll anchor up or what. I really want to figure out how to catch big tarpon with a circle hook instead of those rapala type lures and all those treble hooks. The winds have died down some and the bite has still been good offshore. The 28′ center console went 4 for 9 on sailfish today…the guys ahd never fished in the ocean before so they lost a couple that they shouldn’t have but still a good day. The 33 proline released 3 sailfish, a mahi and a blue marlin today. The 60 Betram went 7 for 11 on sailfish today. The winds and the good bite offshore has continued the past few days. 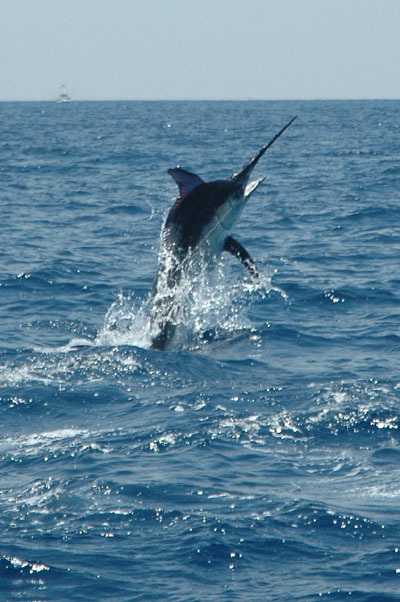 The guys on the 38′ custom said they were in 6 to 8 ft waves 35 miles out and raised 15 sailfish and released 7. 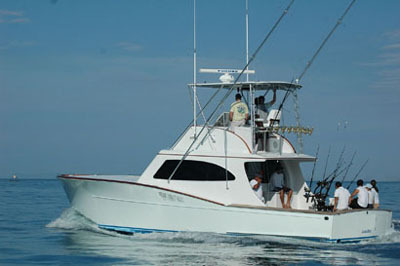 One of the 42’s was about 50 miles south and they raised a dozen sails and released 6 as well as a blue marlin. 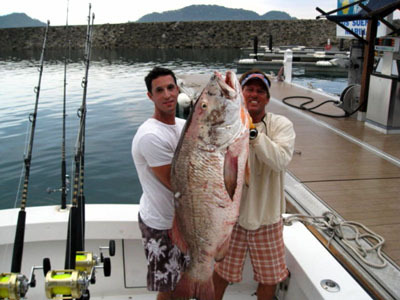 The cubera snapper above was caught by the 36′ topaz last week…about 75 pounds…a monster for these parts. The captain has the head in his freezer because he wants to have a mount made with the real jaws and teeth of the fish. One of the best boats, captain and crews had some days canceled at the end of March and they are open March 22 to march 30. I have fished with these guys dozens of times and they spoil you for other boats. Normally $1750 but any of these dates are now $1650. Contact us if you are interested…these days will get booked up. 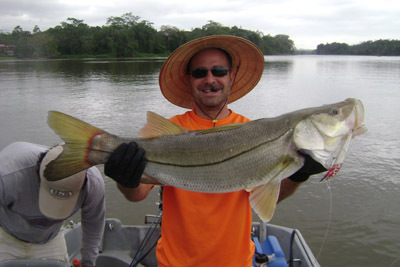 You are currently browsing the Costa Rica Fishing Reports blog archives for March, 2010.